Fujitsu Limited and Red Hat, Inc. today announced that they have strengthened their global alliance for providing Linux support services for mission-critical environments. Building on the maintenance and support expertise Fujitsu has cultivated through its mainframe systems, the two companies have jointly developed new Linux support services that are designed to provide quicker response times and extended support periods for mission-critical systems. The new support services will be available beginning today for the Japan market through Fujitsu, and gradually expanded to other geographic markets in the future. The number of customers using Linux, the open-source and vendor-independent operating system, for mission-critical and other applications continues to increase. Since forming a global alliance in May 2003, Fujitsu and Red Hat have been working together in software development, marketing, sales, system configuration, and support for Red Hat Enterprise Linux solutions in mission-critical environments running platforms that combine Red Hat Enterprise Linux with mission-critical Fujitsu PRIMEQUEST servers and PRIMERGY PC servers. Under their strengthened partnership, the companies will offer new Red Hat Enterprise Linux support services which will extend the bug fix support periods for the update releases 5.2 and 5.3 of Red Hat Enterprise Linux software longer than the current period. This will provide customers with an opportunity for greater ease and reliable use of Red Hat Enterprise Linux for their enterprise systems. 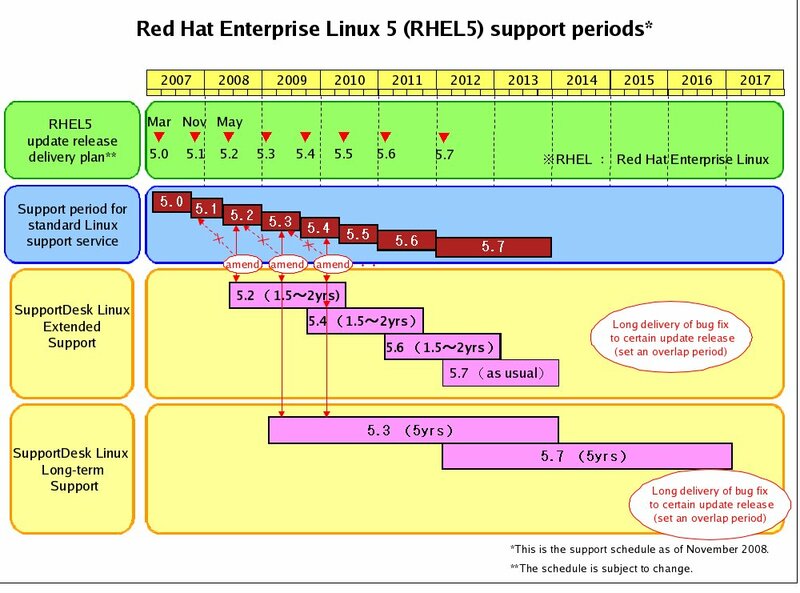 Red Hat Enterprise Linux is usually updated periodically to improve its functionality. Because regular Red Hat Enterprise Linux support services only provide troubleshooting support for the most recent release, customers are encouraged to update their operating system to the latest release every six months. Under the new SupportDesk Linux - Extended Support for enterprise systems, Fujitsu will extend this support period to one and a half year to two years for the most recent release of Red Hat Enterprise Linux 5.2, as well as for future Red Hat Enterprise Linux versions, including 5.4 and 5.6, and will offer an additional six-month overlap period, so that customers can carry out planned updating and avoid unpredictability in the operation of their systems. This is a level of Red Hat Enterprise Linux support services specifically intended for companies that have the greatest need for system reliability, such as financial services and telecom companies. This service will extend the troubleshooting support period for the upcoming availability of Red Hat Enterprise Linux 5.3 and Red Hat Enterprise Linux 5.7 to about five years, with a two-year overlap in each case. Thus, customers will have ample time to acclimate their systems to each release, permitting one update to run over a long period, in accordance with the customer's systems maintenance schedule. Furthermore, Red Hat has assembled a dedicated high-reliability support organization, with customized support locations and faster troubleshooting and response times. This organization will provide customers with an even greater level of support. The version numbers and dates in the following graphic are for illustrative purposes only. Another customer benefit to come from the alliance between Fujitsu and Red Hat is official support for Shift-JIS, a method for encoding Japanese text, on Red Hat Enterprise Linux 4 and 5. This will enable customers to quickly and inexpensively migrate their COBOL assets to the Linux environment and ensure ongoing support for Shift-JIS in the Linux environment for a fixed period of time during the planned transition to the Unicode standard. Fujitsu and Red Hat look forward to continuing and strengthening their close cooperation to provide customers with products and services that anticipate their needs and to promote the use of Linux in enterprise systems. Fujitsu is a leading provider of IT-based business solutions for the global marketplace. With approximately 160,000 employees supporting customers in 70 countries, Fujitsu combines a worldwide corps of systems and services experts with highly reliable computing and communications products and advanced microelectronics to deliver added value to customers. Headquartered in Tokyo, Fujitsu Limited (TSE:6702) reported consolidated revenues of 5.3 trillion yen (US$53 billion) for the fiscal year ended March 31, 2008. For more information, please see: www.fujitsu.com. Red Hat, the world's leading open source solutions provider, is headquartered in Raleigh, NC with over 60 offices spanning the globe. CIOs have ranked Red Hat first for value in Enterprise Software for four consecutive years in the CIO Insight Magazine Vendor Value survey. Red Hat provides high-quality, affordable technology with its operating system platform, Red Hat Enterprise Linux, together with applications, management and Services Oriented Architecture (SOA) solutions, including JBoss Enterprise Middleware. Red Hat also offers support, training and consulting services to its customers worldwide. Learn more: http://www.redhat.com. Certain statements contained in this press release may constitute "forward-looking statements" within the meaning of the Private Securities Litigation Reform Act of 1995. Forward-looking statements provide current expectations of future events based on certain assumptions and include any statement that does not directly relate to any historical or current fact. Actual results may differ materially from those indicated by such forward-looking statements as a result of various important factors, including: risks related to the integration of acquisitions; the ability of the Company to effectively compete; the inability to adequately protect Company intellectual property and the potential for infringement or breach of license claims of or relating to third party intellectual property; risks related to data and information security vulnerabilities; ineffective management of, and control over, the Company's growth and international operations; adverse results in litigation; and changes in and a dependence on key personnel, as well as other factors contained in our most recent Quarterly Report on Form 10-Q (copies of which may be accessed through the Securities and Exchange Commission's website at http://www.sec.gov), including those found therein under the captions "Risk Factors" and "Management's Discussion and Analysis of Financial Condition and Results of Operations". In addition to these factors, actual future performance, outcomes, and results may differ materially because of more general factors including (without limitation) general industry and market conditions and growth rates, economic conditions, and governmental and public policy changes. The forward-looking statements included in this press release represent the Company's views as of the date of this press release and these views could change. However, while the Company may elect to update these forward-looking statements at some point in the future, the Company specifically disclaims any obligation to do so. These forward-looking statements should not be relied upon as representing the Company's views as of any date subsequent to the date of the press release. All other product names and company names mentioned herein are trademarks or registered trademarks of their respective owners. Information provided in this press release is accurate at time of publication and is subject to change without advance notice.